RFID Waste Management :- By using an RFID system, waste can be identified and traced through the entire waste chain. Many jurisdictions and private sector operations have attached RFID tags to waste containers and equipped their trucks with RFID readers thereby improving sortation, validating and verifying pickups, tracking the number of times a container is used for collection as well as tracking the weight of the container’s contents at each and every pickup. A waste management system using RFID simplifies billing for service and supports the implementation of incentive-based invoicing. RFID used in conjunction with GPS is also providing real time visibility to all waste management activities. RFID is now being used by municipalities and private operators to monitor waste pickup. Waste disposal trucks equipped with RFID readers pick up bins that are equipped with RFID tags. The readers record the exact time and location every time a waste container is emptied. This introduces a new degree of monitoring and control of the waste disposal process. With an RFID based system operators have accurate and realtime data that can be used for customer billing as well as route and resource planning. The real time aspect allows municipalities to monitor performance of contractors. Waste containers come in many forms, materials and sizes, but they are all subject to harsh environments and rough handling. Being outdoors, waste containers face all the elements: cold, wet and heat and being waste containers, they endure both human and machine abuse. Only RFID tags can withstand these conditions and continue functioning throughout the life cycle of these containers. Easier recovery of lost or stolen carts. Easy accounting of travel routes of garbage trucks and automatic recording for each individual cart pickup with no required driver interaction on pick-up route. Cheaper, faster, more accurate data reporting. No manual data-entry is required. Allows municipalities to monitor performance of sub-contractors. Unprecedented degree of control and traceability in disposing of hazardous or otherwise sensitive waste material. Easier waste sorting at household level. Less collection points and containers required on recycling. Less cleaning and maintenance work on recycling. On Recycling, Improved rate on ‘waste-to-energy’, spares natural resources. Incentive-based recycling programs that accurately reward customers for the amount they recycle, while minimizing the amount of trash headed for the landfill. Improves the accuracy and efficiency of bill-by-volume waste collection. 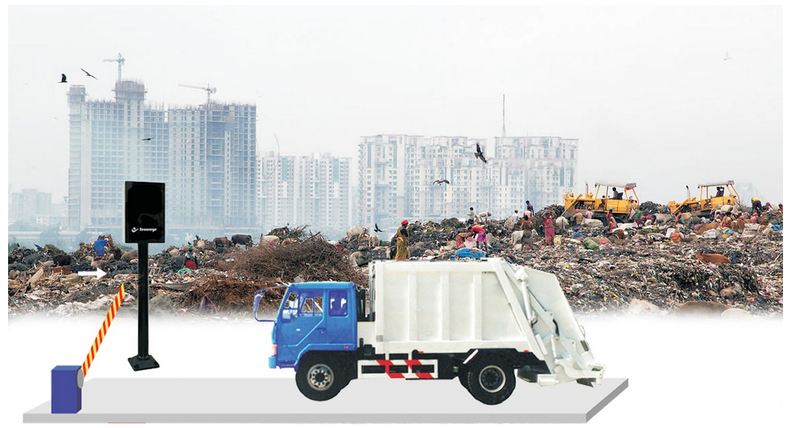 Centralized web based system for monitoring of the complete Solid Waste Collection & Disposal activities integrated with RFID readers, cameras, biometric and GPS.